Step in to the world of a Stickabouts® Magical Island. 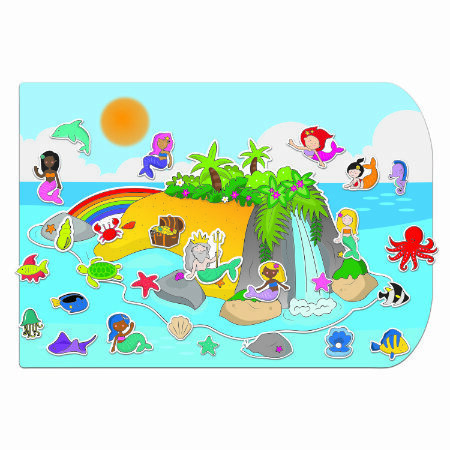 Made from the popular Stickabouts® material, there is a big Island scene piece with matching character and prop pieces such as mermaids, fish, and other underwater creatures! Stickabouts® are glue free stickers that are washable and reusable. Meaning that if they ever lose their stickiness simply wash the pieces with water and they are back to normal! The Magical Island is great for creative play in the bath or bedroom  or any room with a smooth surface that it will stick to. Children will love placing the character and prop pieces onto and around the large colourful scene, creating their own fantasy stories and keeping them entertained for hours.